Gear couplings like all other shaft coupling devices perform the basic functions of connecting two shafts to transmit torque and compensate for misalignment. Gear couplings though are the king of the coupling types. While each type of coupling has its own niche, gear couplings are more power intensive, have more modifications, and a wider size, torque, and bore range than all the others. Gear couplings can also perform at extremely high rates of speed. As inferred by the name, gear couplings use the meshing of gear teeth to transmit the torque and to provide for misalignment. To give you some idea of the differences between gear couplings and other types look at the sales by size and the torque capability per pound of coupling. While some may argue that the sale of gear couplings is not growing compared to other types, there are so many gear couplings installed in rotating machinery that the replacement business keeps the product sales robust. Actually gear couplings can do things that many other couplings cannot do or can only do with difficulty or with expensive modifications and de-rating. Gear couplings have axial slide capability, low speed high torque capability, shifter capability and spindle capability not found in other couplings. They are easily modified to shear pin service, floating shaft type, vertical type, insulated type, limited end float, and can have a brake drum or disc features added. While those latter items may be available on other couplings, it is usually easier and less costly to modify the gear couplings. Gear couplings are power intensive. That means more torque transmitted per pound of coupling weight and per cubic inch of space consumed. That allows space and weight for attachments without having the coupling grow to unusable proportions. Power intensity and space savings mean the original equipment manufacturer (OEM) can bury the coupling in small out of the way places. When the OEM does that, it can be done with the confidence that the coupling will not fail. The gear coupling has more torque capability than the shaft can transmit. The gear coupling eventually wears without a spectacular failure. Gear couplings can be sized to make sure that wear life is consistent with the rest of the machine's design. The Sier-Bath "C" or continuous sleeve gear coupling has long been a champion of OEM service for its small size, easy installation, and large torque ratings, and the HercuFlex "CX" continuous sleeve gear coupling promised to take this performance to the next level. Gear couplings have been likened to a one-to-one gear box, that is, torque transfers from hub teeth to sleeve teeth and across the shaft gap with no change in RPM. The gear coupling can be configured with two flex planes to achieve parallel misalignment as well as angular and axial, or it can be configured with one flex plane and one rigid plane to limit the misalignment to angular and axial only. The two flex plane version is the most popular, but there are many applications for the single flex plane. Those applications appear in three bearing systems or in floating shafts. Many times the single flex coupling is used in series with another single flex unit to give much more parallel misalignment capability. Gear couplings achieve their misalignment capability through backlash in the teeth, and crowning on the tooth faces. 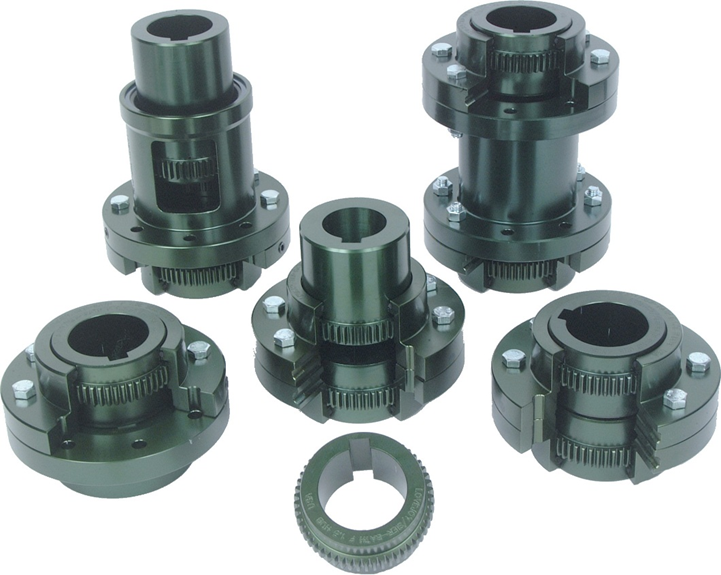 Gear couplings also utilize a major diameter fit which helps the misalignment and assembly capability. Teeth on gear couplings normally use a 20° pressure angle but can also be made with 25° and 40°. The 20° tooth evolved over the years as the most wear resistant and strongest form. The 25° tooth is used on spindles to improve the strength at some sacrifice in wear, and the 40° tooth form is the strongest but is rarely offered anymore.